Summary: Learn how to add a telephone extension, install the first extension socket, install multiple extension sockets, run an extension sockets via a joint box, and troubleshoot a faulty connection. Providing that you have a master phone socket fitted by a service provider, you can connect multiple phone points around the house to the master socket with a kit found in most DIY stores, electrical suppliers or phone retailers. If your master socket is old, you may need to have it replaced with a newer version that will accept the new plugs. The master socket should be less than 50m (164ft) away from the first extension socket. The length of the cable between the master socket and the furthest extension socket should not exceed 100m (328ft). Extensions should not be fitted in bathrooms, wet rooms or near swimming pools. Telephone wiring should be at least 50mm (2in) away from electrical wiring. Lengths of cable should only be joined in a telephone joint box (see below). Cut telephone wire to reach from the master socket to the extension socket, leaving 75mm (3in) excess to allow for connection. 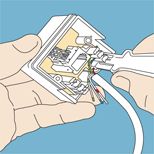 Plan the cable route for the telephone wire from the master socket to the extension socket. The converter on one end of the cable should be placed at the master socket end of the route but do not connect it yet. To fix the cable to skirting board, secure it with cleats hammered in at regular intervals. Unscrew the face-plate on the extension socket. Press out the tab filling the cable entry hole. Position the mounting box against the wall. Mark the position of the screw holes. Drill and plug the holes. Remember that it is easier to screw the mounting box to the wall after you've wired the socket. Prepare the cable for connection by stripping about 30mm (1 1/4in) from the end of the cable with a sharp knife and separate the colour-coded conductors. The conductors are connected to the extension box either by screw-down terminals or by pushing the conductors into brass blade terminals with a cable connector tool. If working with screw-down terminals about 5mm (1/4in) of the insulation needs to be stripped from the conductors. Connect the conductors as follow: the green conductor with white rings goes into terminal 1: blue with white rings into 2: orange with white rings into 3. Now working from bottom upwards, push the white connector with orange rings into terminal 4: white with blue rings into 5: white with green rings into 6. If you have only four conductors, leave terminals 1 and 6 empty. Fix the face-plate onto the mounting box and plug the converter into the master socket. The conductors are connected by pushing the conductors into brass blade terminals with a cable connector tool held as shown. Unplug the converter from the master socket. Plan the cable route from the first extension to the next extension socket. Unscrew the face-plate on the first extension socket. Prepare the cable for connection by stripping about 30mm (1 1/4in) from the end of the cable with a sharp knife and separate the colour-coded connectors. At the first extension socket, connect the conductors on the new cable to the same terminals and on top of the existing conductors. You may wish to temporarily remove the socket from the wall to make this easier. Connect the cable to the new extension socket as before. Replace the face-plates on both sockets. To add further sockets, run an extension from the second socket to the third. Continue in this fashion until you have all the extension points you require. Plug the converter into the master socket. To run more than one extension from a single socket, you can run a cable from the converter at the master socket to a telephone joint box. As many as three extensions plus the cable from the master socket can be connected to the joint box. Run the cable from the master socket to the joint box, but don't pug in the converter. Unscrew the face-plate on the joint box and press out the tabs filling the cable entry holes. The conductors are connected to the terminals in the joint box in the same way as described above but with one important difference. The terminals in the joint box are in a line down the sides and not on the left and right as before. Therefore to prepare the cable for connection you will need to strip about 40mm (1 1/2in) from the end of the cable with a sharp knife and separate the colour-coded conductors. 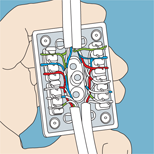 If your joint box terminals are not numbered, connect each conductor to a separate terminal: white conductors with coloured rings in the top terminals and coloured conductors with white rings in the bottom terminals. Fit the first extension socket to the wall. Connect any other extension cables to the joint box, feeding them in from the top or the bottom. Feed cable straps under the pairs of cables and through the holes in the back plate. Pull the cable straps tight and cut off the ends. To fit the back plate of the joint box to the wall, mark the position of the screw holes on the wall. Drill the holes, insert the wall plugs and screw the back plate to the wall. Fit all the extension cables to the sockets. Fix the front plates on the sockets. Plug in the converter at the main socket and all the telephones. The conductors are connected to the terminals in the joint box in the same way as described except they are in a line down the sides and not on the left and right as before. Test all the telephones by plugging them into the master socket after removing the converter and making a call. If none of the telephones work then the fault is with the wiring installed by the telephone company. 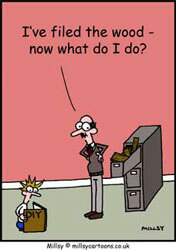 If only one phone fails to work, it is probably faulty. If all the phones work, then the fault is with the new wiring. Check each socket to make sure that all the coloured connectors have been wired to the correct terminals. If you find a wrong connection, remove the connector with a pair of long nose pliers and snip off the end and reconnect to the correct terminal. Once you are satisfied that all the sockets are properly connected, check that the cable is not squashed, kinked or cut. On finding this type of fault you will need to replace the cable. If the phones still don't work after completing all these checks, return all the sockets, the joint box converter and cable to the supplier.